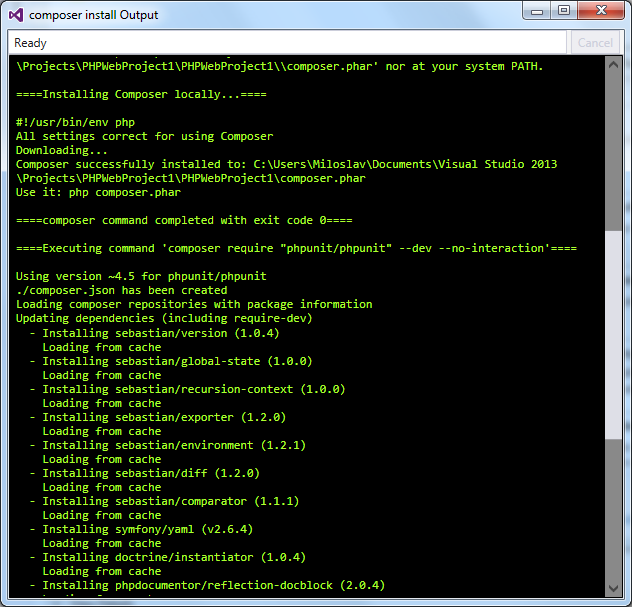 PHP Tools for Visual Studio has an extensive package ecosystem support through integration with Composer. This allows you to install and manage packages to use them in your PHP project. To get yourself familiar with the basic Composer functionality please check getcomposer.org to learn more. This text will assume you are familiar with it. Before opening the dialog packages, information has to be loaded from packagist.org , which is usually very fast. If your connection is very slow you can close the dialog and continue your work, the process will continue on the background. You can see the progress in the composer log in Output pane. Once packages information is loaded, you can search for the package you are interested in and install it. 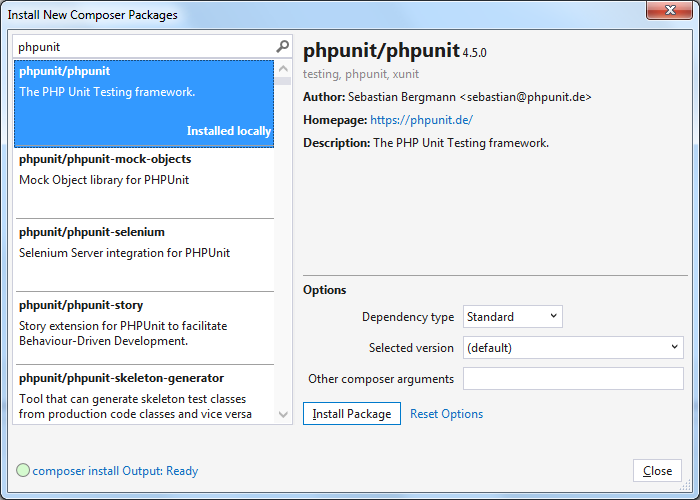 For example, you can install phpunit as shown in the picture bellow. Select dependency type development (it will add the package to composer.json under require-dev) and version default, which will install the latest release. The command status indicator is located in the lower left-hand corner. You can immediately see if something went wrong with the executed command. Or if you wish to see the details about the installation, you can click on the link which will open the Composer Output Window. Composer will continue running in the background when you close the dialog (composer output will be printed to the composer log in the Output Window.) This applies to all composer commands executed within our IDE. A workaround is to install the package in the project with a shorter path. Then you will be able to install it also in this project as the package will be installed from the Composer cache. 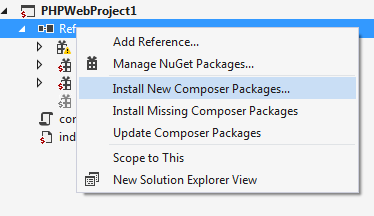 You can view and manage composer packages under the References node in the Solution Explorer. 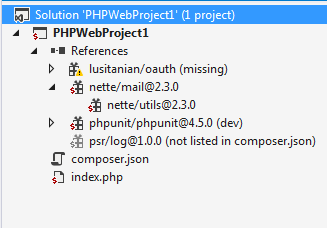 This reflects the content of project's composer.json file and the actual install status of the packages. Dependency type: All the required packages appear directly under the References node. 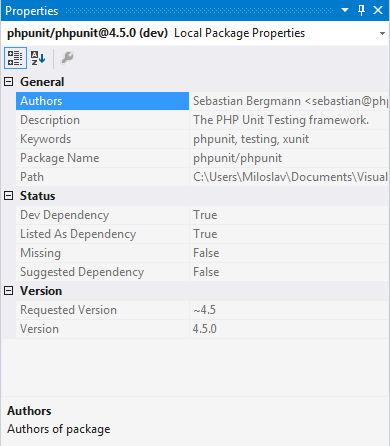 Development packages (defined by require-dev in composer.json) appear with (dev) after the name of the package. You can expand the package node to browse its dependencies. You'll see all the required packages including the missing ones and installed development packages (you won’t see those as missing if they are not installed, only the top development packages are shown as missing). If you prefer to run commands in the command prompt yourself, you'd just need to start cmd.exe with a working directory set to your project root directory. Then you can run composer commands the old-fashioned way assuming you have composer.phar in your project root or installed globally (absolute path to composer.phar has to be present in the PATH environmental variable). Note: Direct edit of composer.json will cause that composer.json and composer.lock will be out of sync. This means that Composer will display a warning when executing an install command and nothing gets installed. You can either delete composer.lock or call update command instead. 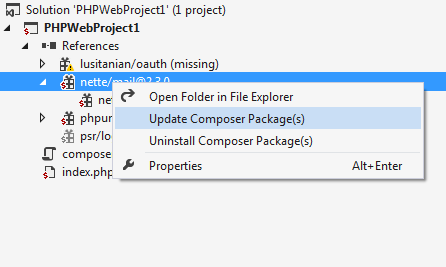 All composer commands executed in the Visual Studio outputs to the Composer Output pane. In the Show output from drop-down, select Composer. This is very useful to debug any composer related issues. There is also one DownloadComposerPhar property which is by default turned on true, indicating whether to download composer.phar file if it is missing from the project root. You can easily test this by running Rebuild on your PHP Project. 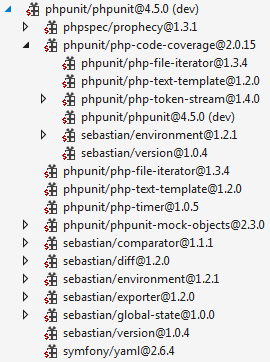 Note: PHP Console project phpproj file has to contain CoreCompile target definition.